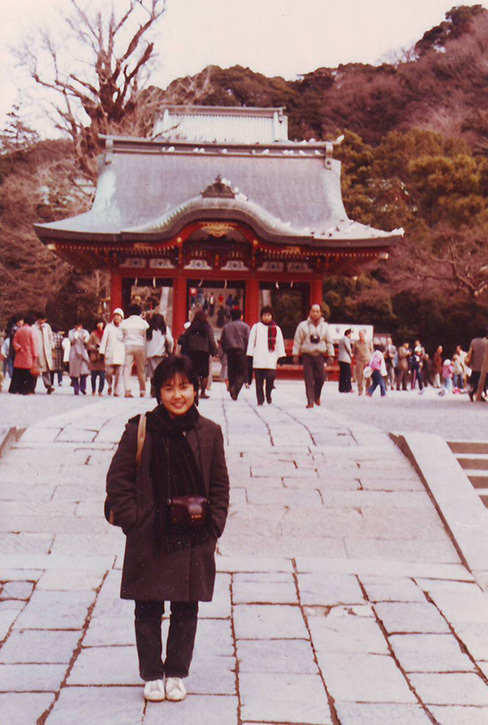 Mystery writer Naomi Hirahara has always loved stories. “I went to the library and whenever there was a summer reading club I’d just go nuts and bring home a stack of books that was probably larger than I was. I was curious about other people, other families, other worlds, and books enabled me to travel to different places without moving.” She began to write novels during summer vacation as an elementary school student in Altadena, Calif., a city in Los Angeles County of about 40,500 people at the time. As an only child for eight and a half years, she initially wrote stories about the large Western pioneering families she read about in books. At her fourth grade teacher’s encouragement, Hirahara began to write funny, silly stories about people from Japan coming to America. “That was the first time I attempted to write something about my own background. At the time, there weren’t all these Asian American books for young people. I didn’t have models of what that looked like for me,” said Hirahara, whose writing has become the model she lacked as a child. 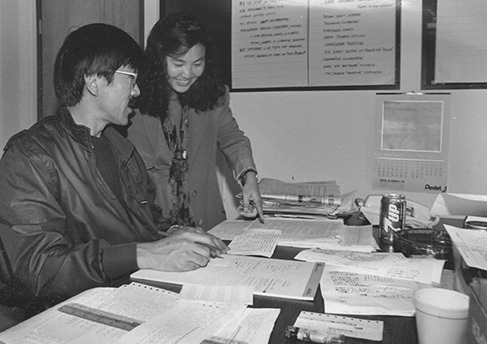 Her journey as a writer focused on Japanese American characters has been shaped by her ethnic roots and self-discovery process. 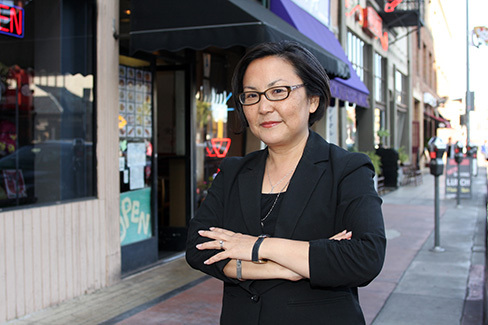 Hirahara grew up in Altadena in a primarily African American neighborhood, then later South Pasadena in a white neighborhood. She lived in a bilingual household and interpreted the multicultural outside world for her parents. Her father was born in Watsonville, Calif., grew up in Hiroshima, Japan, and survived the atomic bombing in 1945; her mother was born and raised in Hiroshima and lost her father – Hirahara’s grandfather – to the bombing. They moved to Pasadena in 1960 after they got married. In the following years, Pasadena Unified School District introduced busing to integrate the schools. Her family experienced the ramifications of desegregation when white residents began to move out of the school district. 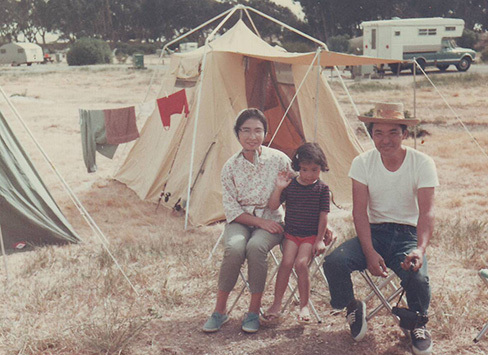 Hirahara at around six years old during her family’s regular summer camping trips along the California coast. Her mother Mayumi is on the left and father Isamu is on the right. Her younger brother, Jimmy, was born when she was eight and a half years old. Connect with Naomi Hirahara via Facebook and Twitter. 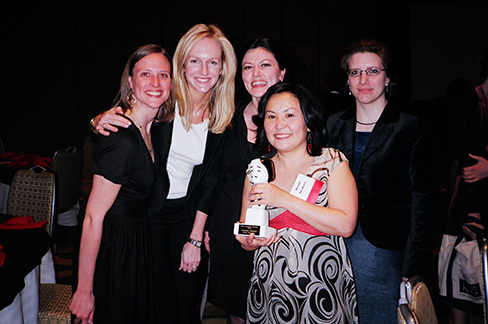 Hirahara’s first mystery, Summer of the Big Bachi, was a finalist for Barbara Kingsolver’s Bellwether Prize and was nominated for a Macavity mystery award. Snakeskin Shamisen, the third mystery in the Mas Arai series, won an Edgar Allan Poe award in the category of Best Paperback Original. She has also published short stories in various anthologies, a number of nonfiction books, and 1001 Cranes, a middle-grade book recognized with an Honorable Mention award in Youth Literature by the Asian/Pacific American Librarians Association. Murder on Bamboo Lane, the first book in her new mystery series about 23-year-old LAPD bicycle cop Ellie Rush, was released in April. Her mysteries are available wherever books are sold and may also be purchased online here. Thank you, Courtney, for a great story. You pressed me for information in certain areas, and I really appreciate that.